Following is a little sneak peek of each project. Can you guess which one is mine? Ha! I bet you can as I have stayed true to my "design style". Cost for these tutorials is $15. 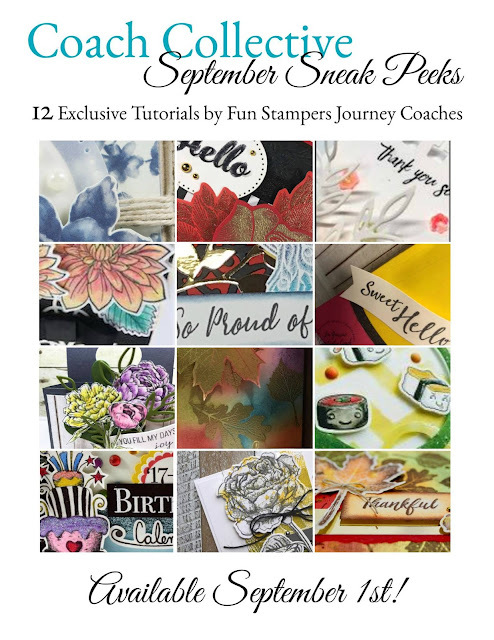 Your PDF Tutorial includes 12 projects, each with a detailed Fun Stampers Journey Supply list and step by step instructions. Click on the PayPal button below to pre-order yours today! Placing an order of $50 or more through my website: funstampersjourney.com/kazan earns you a FREE copy of this tutorial during the month of September. Received your copy and then decided to order in September? Lucky you - a $15 Gift Certificate to FSJ from me will be right on it's way! I hope you are going to enjoy your tutorials as much as we enjoyed creating it for you.